Looking to make a truly big splash with your marketing in 2019? A high-volume influencer campaign may be the best way to get the word across to your target audience, without the distrust and disinterest that can accompany advertising efforts. High-volume influencer marketing allows brands to reach consumers with content that feels organic and relevant, while also benefiting from the economies of scale. 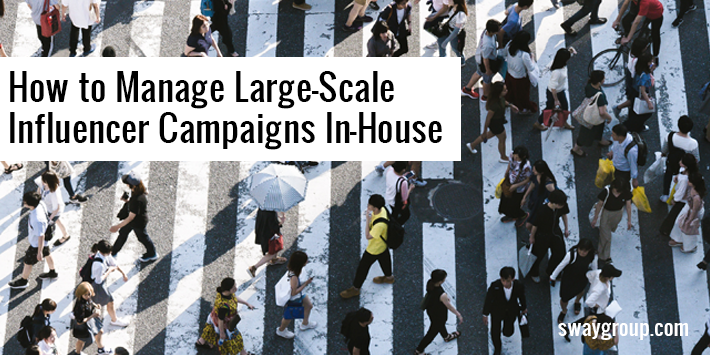 However, large programs can come with logistical challenges as you look to scale your campaign across tens or even hundreds of influencers. Finding and vetting large numbers of influencers that are a contextual fit for your brand can be difficult and resource intensive. While it may be a relatively simple task to identify five Instagrammers to partner with, finding 30 or 50 new people each month is a whole different ball game — and there’s no easy way to automate the process of recruiting individual influencers, not to mention handling logistics like negotiation, content creation, and payments. Without sounding too self-serving, when it comes to recruiting a large number of influencers, outsourcing is often the most efficient and cost-effective method. Your influencer contract needs to clearly state the goals and expectations of the partnership, including compensation and usage rights. While a set offer can streamline the process, be prepared for negotiations. Many influencers, even those at the nano or micro level, are now engaging managers to handle their contracts, which can extend the negotiation process and increase compensation requests. This is particularly prevalent for Instagram, although we’re seeing it for other platforms as well. Remember, it’s always okay to walk away from a contract that isn’t meeting your needs or is simply taking too much back and forth. The influencer brief is a document that ensures influencers know what is expected of them, and clearly outlines the contracted deliverables. If you’re working with an agency, they will create this brief on your behalf, but otherwise, you should at minimum clearly outline the campaign goals and key product and brand messages. Further details can include content prompts, a theme outline, what not to include (i.e., messaging to avoid), detailed social share requirements such as links, hashtags (and who to tag), image direction including brand assets and sample photography, deadlines, exclusivity and licensing requirements, and FTC disclosure guidelines. Once influencers have their instructions, you need to make sure there is someone available to answer questions or provide direction throughout the creation stage. Every influencer marketing campaign should also include the ability to quality check the content — all social posts, images, hashtags, links, blogs, etc — both during the development process and after it goes live. At Sway Group, we have dedicated QA experts who personally review every single piece of content at various stages in each client’s program, but your own QA process will depend on the size of your team, the number of stakeholders, the scope of the campaign, and so on. The type of metrics you’ll want to measure will be based on your program objectives, whether that’s video views, post shares, likes, newsletter signups, coupon code redemptions, sales, or other metrics. Our agency has a comprehensive reporting system that helps clients understand every detail behind their campaign performance. If you don’t have software to help pull that together, you can analyze your influencer’s individual posts or request that they self-report their metrics. Now that you’ve made the investment in producing large volumes of influencer-created content, consider repurposing that content for even more engagement. Personal stories, craft tutorials, recipes, fashion inspiration boards, makeup how-tos — extending this content beyond additional social shares can add effective touchpoints with your target market. Remember, content versatility is completely dependant on usage rights, so be sure commercial rights are confirmed and approved by both parties in the contract. Managing high-volume influencer campaigns requires a strategic approach for recruitment, creative ideation, negotiation, communication, and execution. If you’re a brand that currently executes campaigns in-house (or is thinking about doing so), please check out our Influencer Marketing Workshops. We have pulled together the playbooks our teams use every day with our brand and agency partners to develop a workshop series to teach you how to manage and scale your influencer marketing programs. We break down each section of the process and give you the tools you need to be successful. Reach out below and we can walk you through how it works.